MoneyWorks is accounting software. It does not have a built in Fixed Asset module, which tracks the purchase and allocation of asset, neither it has a depreciation calculator that tracks the monthly or yearly depreciation of its useful life. The workaround method that you may consider using to track the purchases and allocation of asset is to enter a memo in the description field of the Purchase Invoice when the asset is purchased. You may record the warranty information and the location (which department) and the user of the asset (if it is an office equipment such as a computer). The double entry for the Purchase Invoice transaction is debiting the Fixed Asset account and crediting Accounts Payable (You may also scan the original bill and warranty card into PDF and attach it to the Purchase Invoice for future reference). 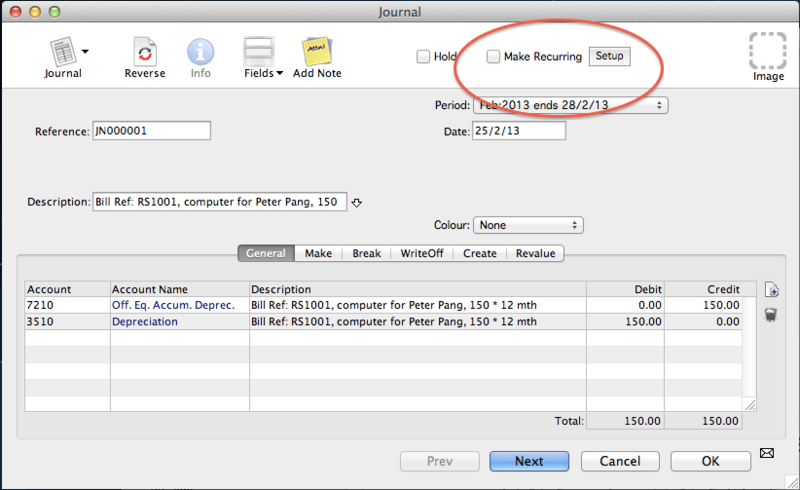 A Journal will be used to track the depreciation of the asset. The double entry is debit Depreciation expense and credit Accumulated Depreciation account (Fixed Asset account type). Besides, you may also record the depreciation detail such as Asset name, Purchase Invoice number, years of depreciation, monthly or yearly depreciation amount (this information is useful in disposal of fixed asset or checking of warranty status). 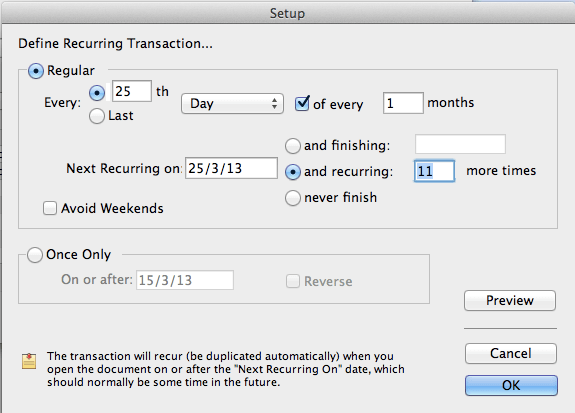 Next, check the Make Recurring checkbox and set the recurring detail of this journal; such as next recurring date and recur for how much more time. This entry was posted in Accounting, MoneyWorks, MoneyWorks v6 and tagged accounting software, Depreciation, Fixed Asset, mac accounting software, MoneyWorks, MoneyWorks Singapore, Singapore, Small Business Accounting Software, software. Bookmark the permalink.